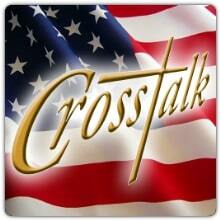 Crosstalk is a radio talk show heard weekdays on over 100 radio outlets across America and worldwide on the Internet. Crosstalk covers the issues that affect our world, our nation, our families and the Christian church from a Biblical perspective. Issues involve the economy, the political scene, the continuing moral collapse of our nation, legislation that affects the family, or the state of evangelicalism. Host Jim Schneider has worked for over 30 years to bring solid information to the body of Christ.